OTTAWA - Liberal MP Justin Trudeau says he is upset and offended by a Tory MP who publicly questioned his adherence to the Catholic faith and his suitability to speak to students at a Catholic school. "If they are looking for a truly great speaker, who also happens to be Catholic, perhaps they might invite (Immigration) Minister Jason Kenney," Del Mastro wrote on Oct. 12. "Are there any tenets of the Catholic faith that Justin supports?" Trudeau had been asked by the Peterborough Victoria Northumberland and Clarington Catholic School Board to speak to 300 students from six area high schools on Oct. 13 at a downtown hall. Trudeau says he spoke for free, and the topic was the importance of young people showing leadership. "I have to say, I'm really surprisingly upset. I didn't think I would be, but I am," Trudeau told The Canadian Press on Tuesday evening. "My own credo is completely consistent with that, and I'll defend my own faith and my own values to the utmost extent," Trudeau said. "To have someone like Dean Del Mastro question me on that is, I think, we're sinking to definite new lows in politics and it doesn't surprise me, it just manages to continue to dismay me." Del Mastro stands by his original comments, saying Wednesday that Trudeau's public positions "are often not in any accordance with the Catholic faith." He has been critical in the past of Trudeau receiving money to speak at different venues. The Conservative MP says he takes issue specifically with the message that Trudeau is sending to the young people. He points to a recent radio interview Trudeau gave. 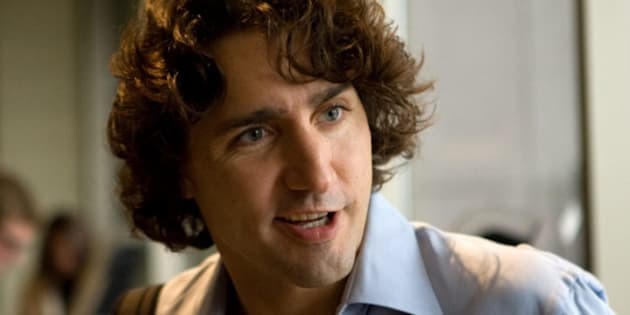 "So what I'd like to do is I encourage them to connect with their world, to go out and occupy something, you know, to get involved in creating a community group, get involved in creating a protest group," Trudeau told CFRA radio on Monday. Says Del Mastro: "I don't encourage people to go out and occupy things. I encourage them to follow through on their education and support them. I don't think that's something that most parents in the Catholic system would appreciate being presented to their kids." 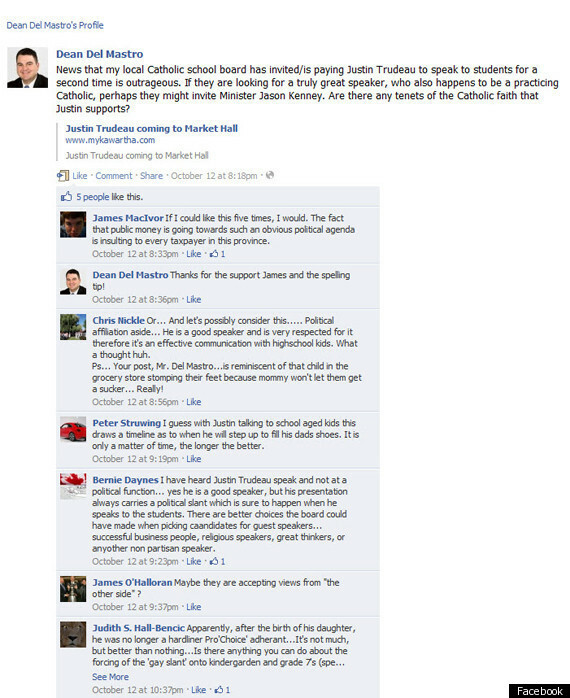 The Peterborough teacher who first invited Trudeau to speak says he finds Del Mastro's comments "petty." "First of all, my question, is: who is the faith police? Who are the people who are supposed to be judging somebody's faith?" said Trevor Digby, department chair of Canadian and world studies at Holy Cross Secondary School. "Is that not a private matter? When we invite speakers, we don't go out and do a police record check on their faith, unless they've done something outrageous." Digby said Trudeau's speech was extremely well-received, and is part of an ongoing series of speeches by Canadians from a variety of backgrounds that are meant to emphasize the importance of international service to humanity. He said he didn't know Trudeau's religious background, and didn't care. "We haven't called them to speak about a theological issue, we've called them to speak on inspiring young people to international service and their place in leadership now in society and make a better world," said Digby. "That our minister of Parliament would have a problem with that I think speaks more about him than about Justin Trudeau." The issue of religion and politics crept into public debate last month, when a group of Conservative MPs participated in a video in memory of a young gay teen who took his life after battling both mental illness and bullying. One of the MPs in the "It Gets Better" video, Tory MP David Sweet, has called homosexuality a sin and a "bad sexual practice" in the past. Other MPs in the video had actively opposed the extension of marriage rights to gays. Some Conservatives referred to the quote "hate the sin, love the sinner," saying there was no inconsistency between Sweet and others speaking out against bullying of young gays and lesbians and their position on homosexuality. News that my local Catholic school board has invited/is paying Justin Trudeau to speak to students for a second time is outrageous. If they are looking for a truly great speaker, who also happens to be a practicing Catholic, perhaps they might invite Minister Jason Kenney. Are there any tenets of the Catholic faith that Justin supports?